GLOW PAINTING : Italian artist Cristoforco Scorpinti gives a whole new way of looking at paintings when the sun goes down. 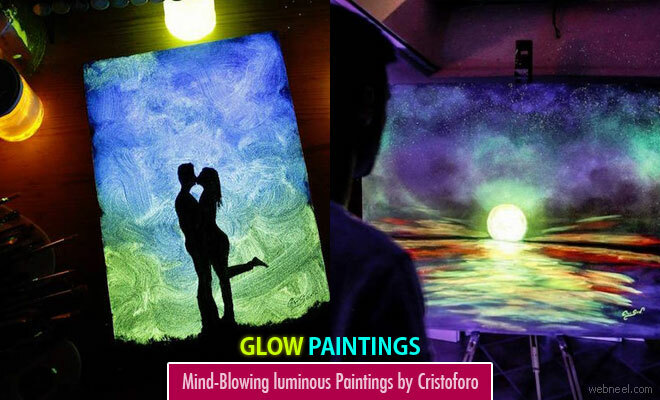 The glow-in-the-dark paintings of cristoforco are amazing and challenging that one can appreciate a painting in full light. His career as an artist was unexpected but when he entered artistic world it was a glorious journey. Cristoforco uses thin layers of luminescent paint, his work has a dual look - one artwork with lights on, and another when they are off. He mainly focuses on animals and dreamy landscapes as his subject for which he uses dark silhouettes and abstract colour combinations to form captivating new appeal.